The official account of the Mazeno ridge expedition of which Cathy was a member, by team leader Sandy Allan. The first ascent of Nanga Parbat via the Mazeno ridge. Short-listed for the Boardman Tasker Prize For Mountain Literature. In the summer of 2012, a team of six climbers set out to attempt the first ascent of one of the great unclimbed lines of the Himalaya the giant Mazeno Ridge on Nanga Parbat, the world’s ninth highest mountain. At ten kilometres in length, the Mazeno is the longest route to the summit of an 8,000-metre peak. Ten expeditions had tried and failed to climb this enormous ridge. Eleven days later two of the team, Sandy Allan and Rick Allen, both in their late fifties, reached the summit. They had run out of food and water and began hallucinating wildly from the effects of altitude and exhaustion. Heavy snow conditions meant they would need another three days to descend the far side of the killer mountain. I began to wonder whether what we were doing was humanly possible. We had climbed the Mazeno and reached the summit, but we both knew we had wasted too much energy. In among the conflicting emotions, the exhaustion and the elation, we knew our bodies could not sustain this amount of time at altitude indefinitely, especially now we had no water. The slow trickle of attrition had turned into a flood; it was simply a matter of time before our bodies stopped functioning. Which one of us would succumb first? In Some Lost Place is Sandy Allan’s epic account of an incredible feat of endurance and commitment at the very limits of survival and the first ascent of one of the last challenges in the Himalaya. 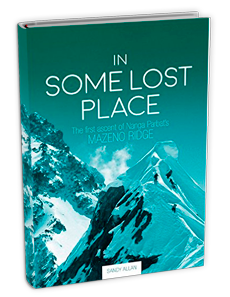 I think “In Some Lost Place” is set to be a modern mountaineering classic; not just for recounting a Piolet D’Or award winning adventure but also for the psychological insights into this rare breed of people with their remarkable skills and mental toughness. In Some Lost Place is a powerful and empathetic account about the dreams of men and the way that many climbers are willing to punish themselves in order to fulfill their ambitions.